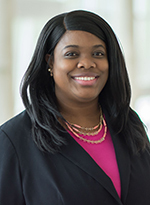 Martina A. Clarke is an Assistant Professor at the University of Nebraska Medical Center in the Department of Internal Medicine, Division of Cardiovascular Medicine. She graduated from the University of Missouri Informatics Institute with an M.S. and Ph.D. in Health Informatics. Dr. Clarke’s research areas includes: user-centered design, usability evaluations of health information technology, needs assessment, and clinical workflow analysis. Her research focuses on determining patients’ communication and technology preferences when interacting with clinicians and managing their health. She investigates how to improve the usability of the personal health record (PHR) and increase PHR adoption. She also works to reduce the impact of cognitive load on physicians when using the electronic health record. In addition to her research duties, Dr. Clarke teaches graduate courses in biomedical informatics and leadership.